It is that time of year again, when we are all very busy trying to complete our holiday decorating, baking, and gift shopping before the “big day” arrives, and this is usually on top of our regular, hectic family schedules. It really is amazing that anyone survives until New years! I know that family meals tend to suffer when our schedules become overly busy, and I just want you to remember that a slow cooker is a great convenience to help you get through the next few hectic weeks. There are so many recipes you can simply throw into your slow cooker first thing in the morning when you are preparing breakfast, then forget about until dinner. 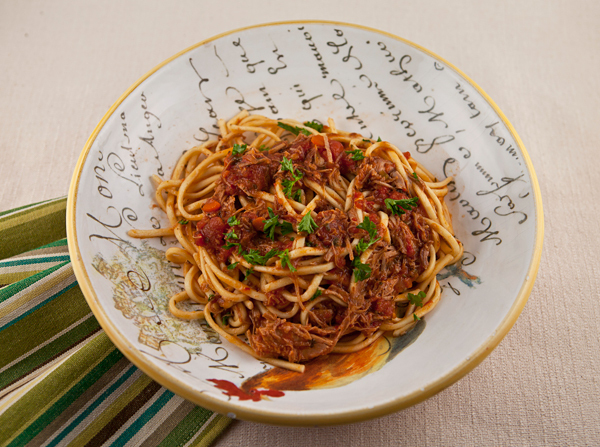 This recipe was created one day when I was craving pasta topped with a hearty, meaty ragu sauce. 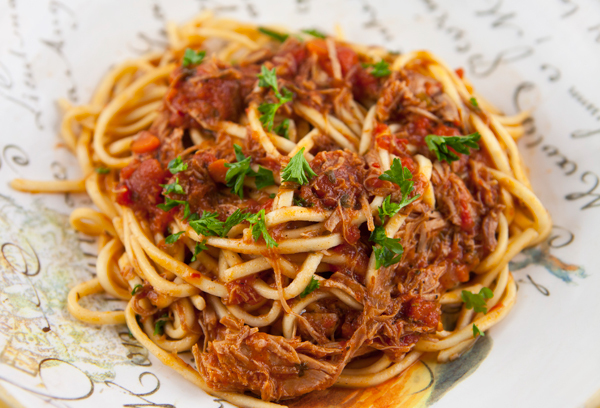 I wanted to make a meat sauce that was a little healthier than my usual one so chose turkey thighs as my meat of choice as they are leaner than red meet and very inexpensive as well. Since I knew my day was going to be a busy one, I decided to pop it into the slow cooker before I became too busy. I chose turkey thighs for my ragu, although you could use ground turkey, a turkey leg, or even chicken in place of turkey if you like. This sauce cooked all day until the meat fell right off the bone, and it was delicious served on Umbrian strangozzi, a long, square shaped pasta, although any pasta shape would work with this sauce. Since the meat came off in long pieces, I did use kitchen shears right in my crackpot to cut the meat into smaller pieces, but you could also leave it as is if you prefer. Turkey is much leaner than pork or beef, reducing fat calories in this dish. Heat the oil in a large skillet and brown the turkey thighs well on all sides, about 8 minutes. Remove the thighs and place in your slow cooker. Add the carrots, celery, onion, and garlic to the skillet, and cook until softened and lightly browned, stirring often, about 8 minutes. Add the wine to the skillet and reduce to less than half over high heat. Add the vegetables and wine to the crockpot along with the tomatoes, paste, water, and seasonings. Stir well, and turn the crackpot on low for 8 hours, removing the lid during the last hour. Cook the pasta in a large pot of lightly salted water until it is "al dente". Toss the pasta with a large scoop of sauce. Serve in individual bowls, with a scoop of additional sauce on each.